Malkangiri (Odisha): Many instances of pregnant women being carried on cots to hospitals by their kin had come to light in the recent past, but Sarigeta village in Malkangiri district witnessed something different. 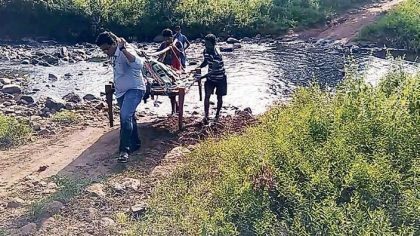 Setting an example for others, a young doctor carried his pregnant patient from an inaccessible village to a hospital on a cot.Faith on doctors ! On being informed about the pregnant woman complaining of labour, the Doctor of Paplur PHC, Dr Omkar Hota, rushed to the village with an attendant. Soon after, the villagers refused to carry the woman to the hospital, Dr Hota and the woman’s husband carried her on a cot for approximately 12 kms. The condition of the woman and the newborn is said to be now stable after medical care and treatment at the hospital. Indian Express rights that the region where Dr Hota practices is one of the most backward regions of Odisha, having inhospitable terrains of Chitrakonda. The village where the woman patient was, Sarigeta, having a population of 250, is 250 kms away from the nearest CHC, with the nearest PHC being, Papulur PHC (New),where the doctor is currently posted. The daily adds that the there is no proper drinking water facility, toilet and round-the-clock electricity supply at the PHC. Though the health unit is supplied with an inverter, the doctor used to save the energy for exigencies. He stays in a room inside the hospital as there is no doctor’s quarters. But even the toughest terrain, and absence of amenities are not to keep this doctor from his duties. His commitment to his patients is so high, that when he was being shifted here from his previous posting at Sudvela CHC ( his home district), the locals of the area, gheraoed the hospital protesting his transfer. The doctor. For his dedication, Hota was awarded as best doctor of the district at the Independence Day celebration on August 15. Highly commendable ethical act by a really dutiful doctor. It is not known whether there is any provision of rewarding such a doctor in the Code of Ethics stated to be prescribed by Odisha State Medical Council? While it is great humanitarian example by the doctor – the government needs to hold all those who held the post and had the responsibility to provide proper infrastructure..
Great but the pathetic condition of facilities after 75 yrs of independence…politicians and bureaucrats pl wake up.